The son of a tradesman, Donnelly was raised in London, Ont. and graduated with a business degree from the University of Western Ontario. He came to Toronto to study law…That businessman turned out to be Colonel Harland Sanders, the founder of Kentucky Fried Chicken…As the years passed, Donnelly continued to provide law services to Sanders. He opened KFC franchises in Canada and joined the company’s board of directors. Terrence Donnelly has given and given. And now he has given again. First, it was substantial sums to St. Michael’s Hospital to create new cardiac research labs, establish a centre for complex heart surgeries and to refurbish its aging Queen St. wing. 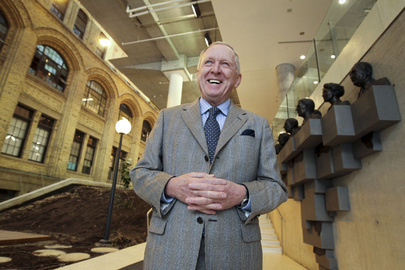 Then, he donated $13 million to help build the University of Toronto’s Centre for Cellular and Biomedical Research, a 12-storey glass structure that has emerged as a bastion of basic scientific discovery. On Thursday, Donnelly pledged $12 million toward the new health sciences complex at the university’s Mississauga campus, where 54 undergraduate medical students will be trained every year. His name is on the side of each of these three structures, which Donnelly says is nice but is certainly not the point. Healthcare is his legacy. And, for him, this latest donation completes an arc of strategic giving. “This closes the circle for health care,” says Donnelly who, at 76, still has a bounding ebullience and piercing Paul Newman eyes. This is a relatively new sentiment for Donnelly. When he was working hard to grow his assets, first as a lawyer, then as a businessman, he never thought he would spend his retirement giving the money away. The son of a tradesman, Donnelly was raised in London, Ont. and graduated with a business degree from the University of Western Ontario. He came to Toronto to study law and settled in the Ford Hotel, which sat at the corner of Bay and Dundas and charged its guests $7 a week. During his law school days, Donnelly worked at the CNE food pavilion, where an acquaintance introduced him to a visiting U.S. businessman. When that businessman later wanted to buy a home in Mississauga in the 1960s, he recalled the young law student and asked him to handle the real estate transaction. That businessman turned out to be Colonel Harland Sanders, the founder of Kentucky Fried Chicken, who came to the meeting wearing his trademark white plantation suit, black bolo tie and silvery goatee. As the years passed, Donnelly continued to provide law services to Sanders. He opened KFC franchises in Canada and joined the company’s board of directors. By the time Sanders died in 1980 at the age of 90, he had passed on his philanthropic beliefs to Donnelly, who is president and director of The Colonel Harland Sanders Charitable Organization, Inc. (Canada). The organization funds hospital and health care projects across Canada. When PepsiCo Inc. bought out KFC’s Canadian operations in 1986, Donnelly became a wealthy man, and now uses his private funds to ensure his legacy. Donnelly retired in 1998, at the age of 64. He sold his law practice, the building in which it was housed and then worried about his retirement. His friend, Dr. Lee Errett, recently installed as chief of cardiovascular surgery at St. Michael’s, introduced him to health care philanthropy. It quickly became his new calling, even though Donnelly himself had never experienced ill health. A few years later, Donnelly heard about the University of Toronto’s efforts to construct a building dedicated to basic science. It would focus on genetics and be the first of its kind in Canada. Its scientists would study cellular and molecular mechanisms. The research findings would provide the foundation for cures for cancer, diabetes, Parkinson’s disease and humanity’s other maladies. Donnelly was hooked. He followed his personal axiom — put money where it would do the most good for the most people — and pledged his support. What makes Donnelly different than many philanthropists is that he sticks around after he writes the cheque. Most days, Donnelly can be found in his third-floor office at the Terrence Donnelly Centre for Cellular and Biomedical Research. He knows nearly all 450 researchers who work in the building by face, if not by name. He can quickly list the countries and states from which top scientists have been recruited. He reads their published scientific papers. He visits their labs. He shares in champagne toasts for a breakthrough. Donnelly is also a constant presence at St. Michael’s — at the Terrence Donnelly Heart Centre, the Terrence Donnelly Day Surgery Centre and the Terrence Donnelly Research Labs — where he observes heart surgeries, visits patients, chats with nurses and feeds the aquarium fish. With talk of creating an office for him in Mississauga at the U of T’s new health sciences complex, Catharine Whiteside, dean of the university’s faculty of medicine, says Donnelly’s presence on campus has always been welcome. Donnelly says the reason for his commitment is simple: He gets the joy of giving. Then, he has the joy of watching his donations at work. “I have the essential ingredients of a happy retirement,” Donnelly says, leaning forward in his chair and looking as eager as a young PhD student. “One, I have a reason to get out of bed. Two, I have a place to go. Three, look around you. Could anybody imagine a more exciting environment than this place?